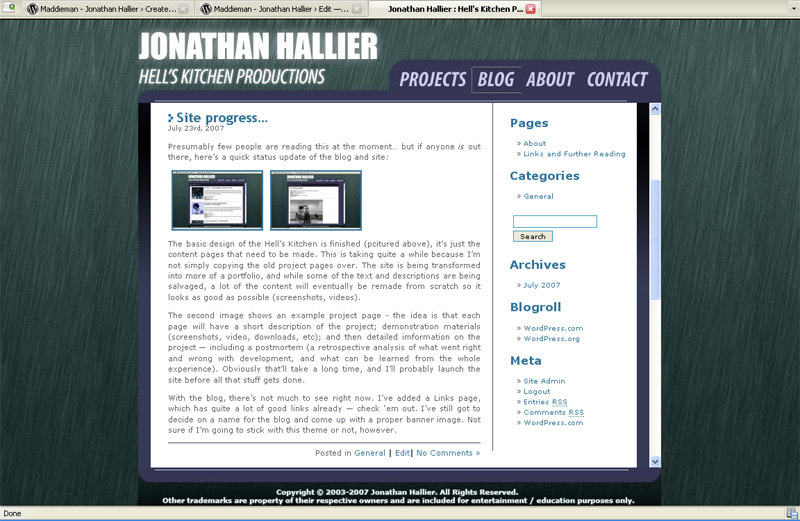 The basic design of the Hell’s Kitchen is finished (pcitured above), it’s just the content pages that need to be made. This is taking quite a while because I’m not simply copying the old project pages over. The site is being transformed into more of a portfolio, and while some of the text and descriptions are being salvaged, a lot of the content will eventually be remade from scratch so it looks as good as possible (screenshots, videos). 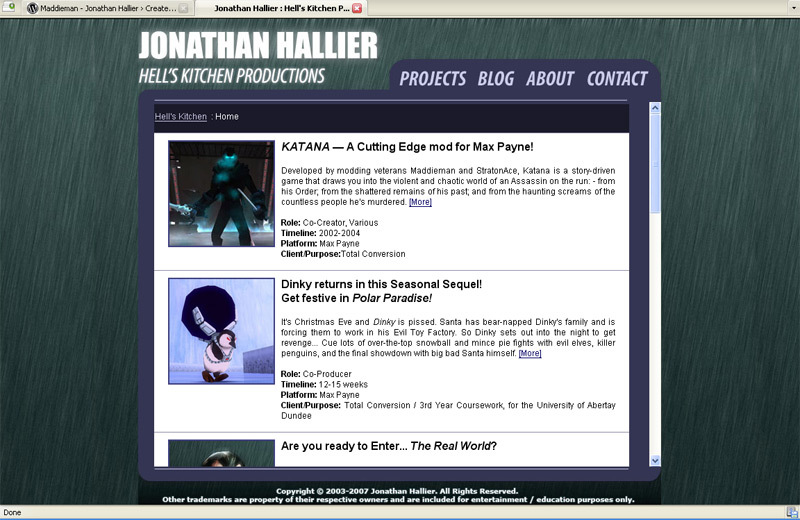 The second image shows an example project page – the idea is that each page will have a short description of the project; demonstration materials (screenshots, video, downloads, etc); and then detailed imformation on the project — including a postmortem (a retrospective analysis of what went right and wrong with development, and what can be learned from the whole experience). Obviously that’ll take a long time, and I’ll probably launch the site before all that stuff gets done. With the blog, there’s not much to see right now. I’ve added a Links page, which has quite a lot of good links already — check ’em out. I’ve still got to decide on a name for the blog and come up with a proper banner image. I’m still not sure if I’m going to stick with this theme or not, although it does seem to go quite well with the hells kitchen design (third picture above).